Chronic pain is a major disruption to life, inhibiting the sufferer from enjoying the things they used to love, like exercise or travel. And if that’s not bad enough, chronic pain can even make it feel impossible to work and maintain their daily lives. And a surprisingly large amount of people carry the burden of pain with them every single day. In fact, about 3-4% of the world population suffers from neuropathic pain, and 20% of American adults say that pain or serious physical discomfort disrupts their sleep several times a week. Managing chronic pain can be frustrating, but this isn’t a problem that will go away on its own. And while prescription drugs can numb the pain for a time, they don’t do anything about the underlying issues. Plus, they carry seriously dangerous side effects, like the risk of developing a tolerance or even addiction. That’s why so many chronic pain sufferers are looking for better way to treat their pain. A quarter of patients with chronic pain conditions have visited a chiropractor or specialized pain doctor to consult about pain management. If and when you feel like you’ve tried it all, to no avail, or that the medication that you’re on just isn’t cutting it, then it’s time to look at alternatives. Consider this: in a recent study conducted by the Archive of Internal Medicine, acupuncture was shown to reduce pain by up to 15% when used for various types of pain (but primarily focused on chronic back pain). Acupuncture, which is an ancient Chinese practice, is so widely accepted that more than 3,000 doctors now incorporate it into their clinical practices. Indeed, acupuncture benefits abound. It can be used for a very large variety of conditions, including acupuncture for emotional issues and acupuncture effects on pain. Some women have even reported acupuncture for pregnancy success. 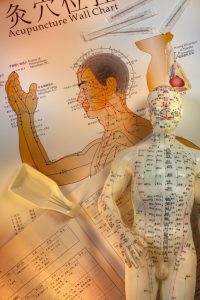 Traditionally, it was believed that acupuncture promoted wellness by allowing the flow of the body’s energy to resume along certain channels. While many people still believe that, today scientists tell us that it may be therapeutic because of its effect on specific nerve loci and acupuncture pain relief points. But first and foremost, acupuncture is not a drug. For people who have jumped through hoops for years trying to treat pain with drugs, alternative treatments offer a relief from side effects, negative synergy with other medications, and the risk of causing even more harm to your body. By accessing the acupuncture pain relief points, many people experience relief from pain, both in the moment and in the long run. Give acupuncture pain relief a try — after all, you have nothing to lose since it won’t cause harmful side effects or chemical reactions.